Please note that this is demo code and I’m simply hooking this up in the code behind. In a larger application, I would typically publish an ErrorOccurred message to my application’s message bus and register a listener that would contain the code in HandleApplicationUnhandledException. Notice that I’m checking whether a debugger is attached. If so, I place the contents of the System.Exception (or derived exception) on the clipboard. (Clipboard is in the System.Windows namespace for Silverlight and WPF apps, but there is an identically-named class in System.Windows.Forms.) The reason that I’m checking whether a debugger is attached is so that end-users don’t get the clipboards spammed with exception text. You could conditionally compile the code so that production builds don’t contain it, but personally I like having the code in production too. It means that I can grab an old build, attach a debugger, and get the same exceptions that the end users are getting. The advantage here is fictionless debugging as you no longer have to find, select, and copy the exception and stack trace to the clipboard. It’s there for you automatically. 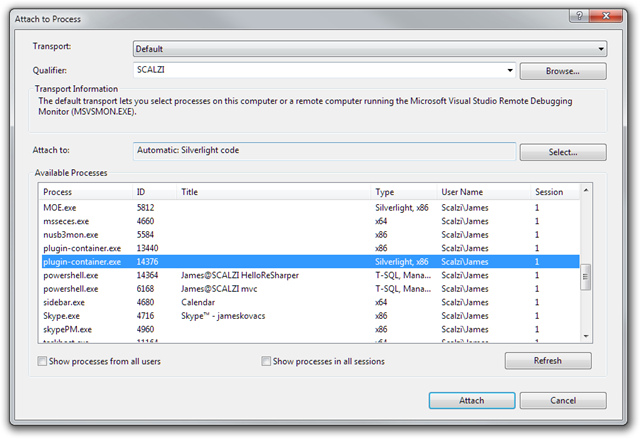 As soon as you hit an exception, simply jump to Visual Studio and press CTRL-SHIFT-E (IDEA) or CTRL-E, T (VS) and you’re ready to find the problem. 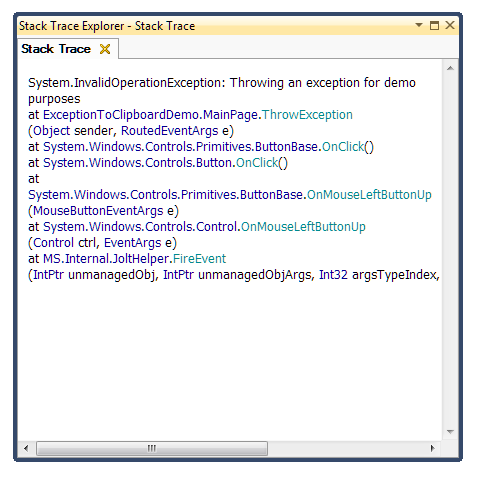 Also note that all the method names in the ReSharper’s Stack Trace Explorer are hot links to the appropriate code file allowing for easy navigation of your code base, the .NET Framework, and third-party libraries. In this post, we’ll examine the ways that NHibernate supports the DateTime-related data types, including some new features introduced in NHibernate 2 and 3. Here is a quick summary for the impatient. Note that I am outputting both CreationTime.ToString() and CreationTime.Kind. DateTime.Kind returns a DateTimeKind (surprising, huh? ), which indicates whether this DateTime represents Local time or UTC time. We initialized the value with DateTime.Now, which is the local time. (If we wanted UTC time, we would use DateTime.UtcNow.) When the object is reloaded, the DateTimeKind is Unspecified. This is because the database does not store whether the DateTime value is Local or UTC. NHibernate has no way of knowing which one it is, hence Unspecified. We are explicitly telling NHibernate whether the database stores Local or UTC times. Notice that NHibernate did not perform any conversions or throw an exception when saving/loading a DateTime value with the wrong DateTimeKind. (It could be argued that NHibernate should throw an exception when asked to save a Local DateTime and the property is mapped as a UtcDateTime.) It is up to the developer to ensure that the proper kind of DateTime is in the appropriate field/property. One problem that LocalDateTime and UtcDateTime does not solve is the offset problem. If you have a DateTime and its Kind is Local, all you know is that it is a Local DateTime. You do not know if that Local DateTime is Mountain (MST), Eastern (EST), Pacific (PST), etc. You do not know whether it has been corrected for daylight savings time. All you know is that it is a Local DateTime. You have to assume that the local time is based on the time zone of the current computer. Although this is often a reasonable assumption, it’s not always. (Consider for example that you’re collecting log files from a distributed system and servers reside in multiple time zones.) The problem is that System.DateTime class does not contain a place to record the timezone offset. Microsoft solved this problem starting in .NET 3.5 by introducing the System.DateTimeOffset class. It looks a lot like System.DateTime, but does include the timezone offset rather than the DateTimeKind. So we can just use System.DateTimeOffset in our applications rather than System.DateTime. DbType.DateTime2 is a higher precision, wider range version of DbType.DateTime. DbType.DateTime maps to the datetime (or smalldatetime) SQL type, which has a range of 1753-01-01 to 9999-12-31. DbType.DateTime2 maps to the datetime2 SQL type, which has a range of 0001-01-01 to 9999-12-31. (Precision can be as high as 1/10 of a microsecond with a datetime2(7).) One of the niceties of DateTime2 is that an uninitialized DateTime struct (which has a value of 0001-01-01 12:00:00 AM (Unspecified)) does not cause a SqlTypeException with a SqlDateTime underflow. DbType.Date does just what it advertises. It represents a Date without a Time component. It is stored in the database as only a date. .NET does not have a Date type and NHibernate represents it via a DateTime with the time portion set to 12:00:00 AM. I personally prefer to define my own Date class, which has no time component, and create an IUserType to handle the mapping. My custom Date class can handle the time truncation and provide a more natural programing model for my domain, but that’s a post for another day. WARNING: Not all databases support all date/time SQL types. So before choosing .NET and SQL types for your entities, make sure that they’re available in all databases that you plan to support. As you have seen, NHibernate has a wide variety of options for mapping date/time-related types to and from the database. The right choice is highly dependent on your application and database server. I hope that this post has given you a few more tricks up your sleeve for effectively mapping date/time-related types using NHibernate. The fluent configuration API built into NHibernate is called Loquacious configuration and exists as a set of extensions methods on NHibernate.Cfg.Configuration. You can access these extension methods by importing in the NHibernate.Cfg.Loquacious namespace. On the second line, we configure the ProxyFactoryFactory, which is responsible for generating the proxies needed for lazy loading. The ProxyFactoryFactory type parameter (stuff between the <>) is in the NHibernate.ByteCode.Castle namespace. (I have a reference to the NHibernate.ByteCode.Castle assembly too.) So we’re using Castle to generate our proxies. We could also use LinFu or Spring. Setting db.ConnectionStringName causes NHibernate to read the connection string from the <connectionStrings/> config section of the [App|Web].config. This keeps your connection strings in an easily managed location without being baked into your code. You can perform the same trick in XML-based configuration by using the connection.connection_string_name property instead of the more commonly used connection.connection_string. Configuring BatchSize turns on update batching in databases, which support it. (Support is limited to SqlClient and OracleDataClient currently and relies on features of these drivers.) Updating batching allows NHibernate to group together multiple, related INSERT, UPDATE, or DELETE statements in a single round-trip to the database. This setting isn’t strictly necessary, but can give you a nice performance boost with DML statements. The value of 500 represents the maximum number of DML statements in one batch. The choice of 500 is arbitrary and should be tuned for your application. The assembly that we are adding is the one that contains our hbm.xml files as embedded resources. This allows NHibernate to find and parse our mapping metadata. If you have your metadata located in multiple files, you can call cfg.AddAssembly() multiple times. The last call, cfg.SessionFactory().GenerateStatistics(), causes NHibernate to output additional information about entities, collections, connections, transactions, sessions, second-level cache, and more. Although not required, it does provide additional useful information about NHibernate’s performance. Notice that there is no need to call cfg.Configure(). cfg.Configure() is used to read in configuration values from [App|Web].config (from the hibernate-configuration config section) or from hibernate.cfg.xml. If we’ve not using XML configuration, cfg.Configure() is not required. Loquacious and XML-based configuration are not mutually exclusive. We can combine the two techniques to allow overrides or provide default values – it all comes down to the order of the Loquacious configuration code and the call to cfg.Configure(). Note the cfg.Configure() on the second line. We read in the standard XML-based configuration and then force the use of a particular ProxyFactoryFactory and generation of statistics via Loquacious configuration. If instead we make the call to cfg.Configure() after the Loquacious configuration, the Loquacious configuration provides default values, but we can override any and all values using XML-based configuration. You can always mix and match the techniques by doing some Loquacious configuration before and som after the call to cfg.Configure(). WARNING: If you call cfg.Configure(), you need to have <hibernate-configuration/> in your [App|Web].config or a hibernate.cfg.xml file. If you don’t, you’ll throw a HibernateConfigException. They can contain an empty root element, but it needs to be there. Another option would be to check whether File.Exists(‘hibernate.cfg.xml’) before calling cfg.Configure().